You may have considered installing a miniature spy camera system but didn’t know where to find one. 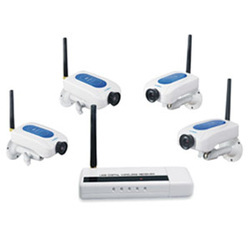 Look no further than the 4 camera system to insure your safety, security, and secrecy. This tiny wireless system (3.5” x 2” x 4” tall with stand, 1” without) features next-generation 2.4 GHz circuitry that eliminates cordless phone interference, and uses special subchannels that prevent it from interfering with routers*. Lose no data when sending your color digital images wirelessly to your monitor. This unit features both remote viewing and motion activated alarms. Typical applications of this camera system include nanny cameras, residential surveillance, business surveillance, and automobile security.